First, we show units of time that are more common organized as a concept web from the smallest unit to the greatest unit. See more explanations below. 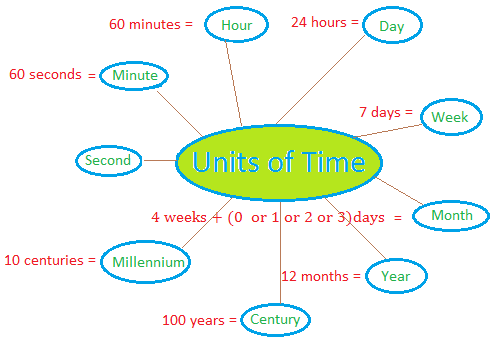 The basic units of time that we are familiar with from the smallest unit to the greatest unit are second, minute, hour, day, week, month, year, century, and millennium. 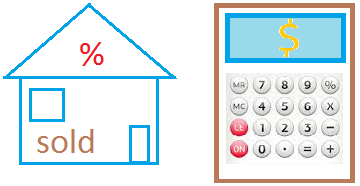 Second is the smallest unit on the concept web. To see how fast a second is, do this exercise. Raise your hand up and immediately lower it down. It took you about a second to do this exercise! 60 minutes = 1 hour. 24 hours = 1 day. How many weeks are there in one month? Well, it depends. Only February can have exactly 4 weeks on a leap year. Otherwise, February has 4 weeks plus 1 day. The other months have either 4 weeks plus 2 days or 4 weeks plus 3 days. To understand what a leap year is, check this site. 12 months = 1 year. 100 years = 1 century. 10 centuries = 1 millennium. Other less common units of time to mention just a few. These are millisecond, microsecond, decasecond, fortnight, quarter, decade, olympiad, jubilee, and megaannum. 1 millisecond = 0.001 second. 1 microsecond = 0.000001 second. 1 decasecond = 10 seconds. 1 quarter = 3 months. 1 decade = 10 years. 1 olympiad = 4 years. 1 megaannum = 1 million year.